I’m OK with comic book adaptations, Cliff, as long as they’re simple enough for me to understand. Haven’t seen the movie yet… Still, I found this post to be very funny. Keep up the good work, Pam. this is like accusing the emperor of being naked when he’s wearing a 5 piece suit and a parka. Maybe you shouldn’t bother seeing movies you’ve already decided to hate. If you had made any attempt to enjoy the movie you were watching, you wouldn’t have had an incessant running commentary in your head, and you would have seen the actors as their characters, not the actors. It’s called willful suspension of disbelief. Perhaps your lifestyle has eroded your ability to concentrate and immerse yourself in a creative work that is not your own. I haven’t seen it yet but if Heath sounds like Paul Lynde, I would recognize the voice. I watched him on Hollywood Squares enough times! I totally agree with you. Saw Iron Man and the Incredible Hulk and I thought they were great…enjoyable characters, a plot that can be followed, etc… The Dark Knight was a terrible movie with a great performance by Heath Ledger, simple as that. It has nothing to do with age that you didn’t understand what was going on (who, what, why, when, why…what! ), the movie was just so terribly edited. And I swear that cop guy with the glasses blurted out Chinese for about 5 seconds near the beginning…was that just me? And I’m 20 by the way. I, too, saw the movie and was baffled. I had so looked forward to seeing this movie as I had really liked the first one with Christian Bale. I could follow the story and was happy to see Maggie instead of Katie. Glad to see Morgan Freeman and Michael Caine, but the whole tongue thing with Heath Ledger got on my every last nerve. I was distracted every time he was onscreen. I liked the character of Harvey Dent better because he seemed more completely drawn out, the Joker was just a one note psycho. I’ve seen the Dark Knight and was scared (yes, wimp) from time to time. The only thing that kept me from losing it was that I read this blog in advance. Each time the Joker did something the slightest bit scary, I’d think, “center square gets the x.” That made it all better. Thank God! My husband and I just walked out of the Dark Knight. We wondered if we needed to have been diagnosed with ADD and on medication to truly appreciate this “epic movie”. 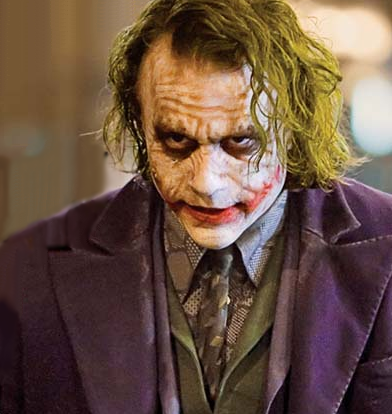 We were in agreement that Heath’s performance of the joker was very good, but if you put all of the time he was in it, it totaled 10 minutes maybe. (We left an hour before it ended). On the way home, we were asking ourselves the exact same questions you listed above. Thank you for validating our thoughts! i agree as well. AND I’M THIRTEEN!!!!! and i’m being completely honest about that. i actually thought that heathe ledger kind of lost touch with his joker role. a lot of it was confusing. like how he turns out to be alive and why his voice sounds so stupid. i thought the effects and stunts were really good. but still i just don’t think it was as good as everyone says!? and i have to say that im thirteen and i understood the movie..
and yeh you should be seeing them as the role theyre playing not who they are in real life.. ffs! No. You are wrong. That movie was great. If you didn’t get the point to the movie about the money or any part of it for the matter, its because you didn’t pay attention to the movie at all. If explains why he goes to China and why that guy takes the money to Chine. You need a better reason for hating this movie, because none of your reasoning makes any sense.